Screwpulp isn’t your typical book company – it’s a new startup, and it’s approaching book publishing with a refreshing approach to book reviews and pricing. Get exited! 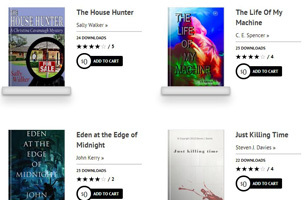 You’re going to get to read new books from new authors for free. The catch is, you have to give honest reviews. Screwpulp? How did you get the name? We get asked this question a lot, so let us explain. The screw press was the first printing method that allowed for books to be made with moveable type in mass. Now that we’re in the digital age, the move away from paper, or pulp, is becoming the new normal. A merging of these two ideas led us to the name we have today, Screwpulp. Screwpulp’s reading model works in favor of new authors. When a new author publishes a title, marketing and PR can consume more hours than actually writing the book. Screwpulp helps writers manages that by gradually increasing the price of books with increased readership. Once a book is downloaded 25 times, it goes from free to $1, increasing incrementally with demand. We like how Screwpulp encourages readers to participate in helping authors edit their work by promising honest reviews. On Amazon, it’s hard to tell if reviews are robots, the writer’s mom, or just the writer in digital disguise. We think authors would benefit by allowing real readers to give feedback, which will help everyone mature, both as writers and readers. Further, we like the fact that Screwpulp allows writers to keep 75% of the sales. That’s better than Amazon’s 40-70%. To get started, check out their list of free books or very affordable best sellers.